If you’re curious what the scariest rides in Disney World are, you’re not alone! Nearly 50 million people visit the 4 Disney parks near Orlando Florida, every year, and many of those guests get their kicks on thrill rides inside the parks. While it’s true that “white knuckle thrills” and “Disney World” don’t often appear very often in the same sentence, it’s also true that there are plenty of breathtaking rides to be found at the Mouse’s House. As a lifelong Floridian, I’ve visited the nearby Disney parks many times. And since I’m a self-proclaimed ride enthusiast, I’ve made a list of some of the scariest rides at Disney World. Without a doubt, Space Mountain ranks as one of the world’s scariest and most well themed wild mouse style roller coasters. Actually consisting of 2 separate tracks (one called Alpha and the other Omega), when Space Mountain opened in 1975, it was one of the first rides of its kind. It combines high-speed thrills with special effects — such as lighted tunnels and strobes — to create a unique, thrilling experience. 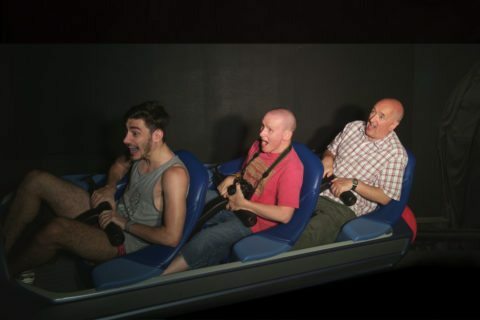 During my first ride on Space Mountain, I swore I was being turned upside down. In reality, the ride features no inversions — nor is it all that fast. The top speed is 28 miles per hour. However, under the cloak of darkness and with tight turns and surprising dips, a trip on Space Mountain is one of the scariest rides at Disney and will thrill the novice and seasoned riders alike. See what it’s like to ride Space Mountain at Disney World. 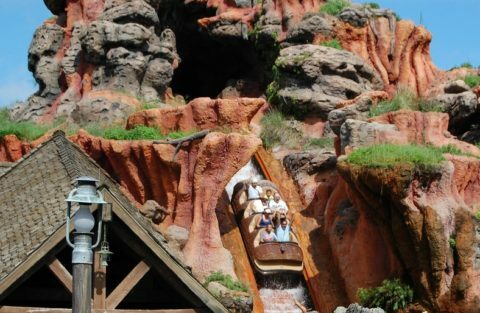 When Splash Mountain opened at Magic Kingdom in 1992, it was one of the most expensive rides Disney had ever built — and a revolutionary concept for a water ride! Growing up with more conventional log flume rides, I (like the millions of others who’ve ridden Splash Mountain) quickly realized that when Disney builds a ride, it often goes big – big as in Splash Mountain’s 52-foot, 45-degree steep drop, that is. One of the scariest water rides I’ve had the pleasure to challenge, Splash Mountain delivers big thrills and even bigger splashes. In fact, the drop at the ride’s finale is just 1 of 4 drops on the ride — including 1 which occurs in the dark! Unlike Space Mountain, which occurs almost completely in the dark, Splash Mountain takes riders outside a few times during its 10-minute long journey. Along the way, you’ll enjoy several bright, cheery scenes from Disney’s 1946 movie Song of the South. TIP: If you want to brave the falls on Splash Mountain, wear a poncho — or you’ll be spending the next several hours sloshing around the Magic Kingdom in uncomfortably wet clothing! See what it’s like to ride Splash Mountain at Disneyland. I had only been riding roller coasters for a few months when I finally hopped aboard the train that winds its wild way through Big Thunder Mountain. Again, Disney pulled out all the stops on theming when they built Thunder Mountain Railroad at Magic Kingdom in 1980. This mine train roller coaster takes you through terrain that is clearly inspired by the craggy cliffs seen throughout parts of the Southwest United States. Along the way, you’ll experience sudden drops, tight twists, and sharp turns that cut through the natural-looking scenery. While any seat on Big Thunder Mountain will provide some of the scariest rides at Disney, I particularly like seats toward the rear of the train — where you can gain some terrific “air time” (feelings of lightness” over the drops). I’ve also found that the ride in the rear rows tend to be a little wilder — mainly because the weight of the front half of the train is dragging its rear half at a fast clip down the hills and through the helixes! 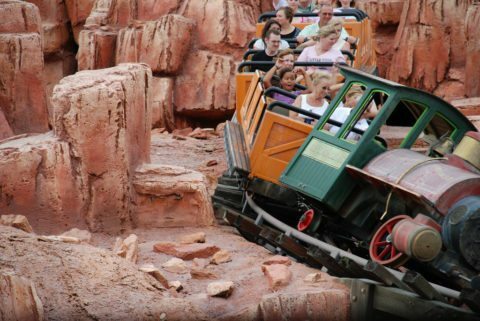 See what it’s like to ride Thunder Mountain Railroad at Disney World. While the Magic Kingdom provides a few good white-knuckle thrills, the three other Disney Florida theme parks in the resort paradise are also home to some incredibly thrilling, scary rides. Over at Epcot, Test Track propels guests at speeds of up to 60 miles per hour while simulating what it’s like to test drive a new vehicle concept. Disney Hollywood Studios is where you can brave the 13-story freefall in the Tower of Terror and jam through twists and turns to the tune of Aerosmith on Rock ‘n’ Roller Coaster. Looming high above Animal Kingdom is Expedition Everest, which boasts an 80-foot plunge and unforgettable encounter with a ferocious yeti that will leave you hollering through the entire ride. TIP: Whatever rides you find to be the scariest rides at Disney, be sure to hit them early! As is the case with many of the other Orlando tourist attractions, lines are almost always long at any of the 4 Disney parks. This is especially true during the summer season, as well as during the winter months — when northern tourists (a.k.a. “snowbirds”) flock to the Sunshine State to enjoy some warmer weather. And, don’t forget to utilize the Disney FASTPASS – a ticket that provides you with priority seating on certain rides during given times on the day of your visit.